Does anyone else have that feeling after Thanksgiving? You exercise everyday, watch what you eat and on this one day you overdo it and you feel like all is lost. I’m going to tell you that all was not ruined. I have talked before about how, if you don’t change your eating habits throughout the rest of the year, changing them for that one day won’t make a difference at all. The same is true if you do what you need to do throughout the year, that big eating day is not going to set you back. Most likely you got right back to the workout and ate something sensible. That is the key and that is what building healthy habits is all about. We have all heard how important it is to “work the core”! A strong core is what we need and really you don’t have to spend hours on this. Sit-ups are not the best way but if that is all you have, make the most of it. Using a stability ball can make all the difference in the world and is a very inexpensive investment. This was my early morning workout. 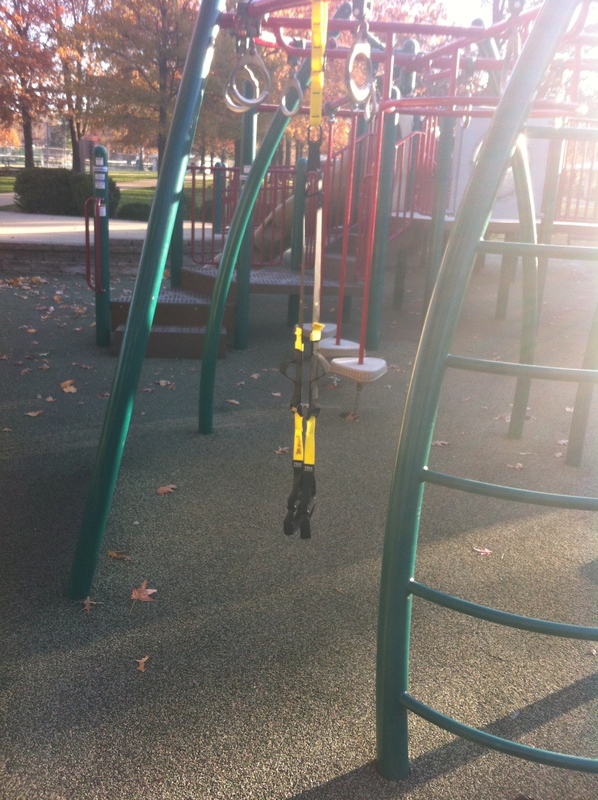 TRX is a fantastic way to gain overall strength and really get your core strong. As you can see it can be used anywhere! This is at a playground and, yes, it was about 20 degrees outside when I did this so there is no excuse! Once you get the blood flowing you don’t notice…sorry, I couldn’t get through that without laughing. It was cold the whole time but just do it! Making simple changes in your life can go a long way in your overall health. Get started today! There is a better way than whey! Protein drinks are all the rage. And, really, it isn’t a bad idea to get some extra protein to fuel your body. Whether it is for a meal replacement or pre/post workout, having the right nutrition is vital. I am a Juice Plus guy. Fruits, vegetables and berries in a capsule, backed by research, is a great way to go. We need the variety that Juice Plus offers, not just the nutrition of one or two berries or synthetic man-made vitamins. The same is true for our protein needs. Getting protein from a variety of sources is better than just getting it from one. And the reality is that plants offer a great source! I’ll discuss what whey is at another time but know that Juice Plus Complete has protein from different plant sources as well as both soluble and insoluble fiber! This is almost unheard of in protein drinks. If you have a protein drink at home take a look at the ingredients. You probably won’t find fiber and there will be one source of protein. There is a reason it is called Complete!